Fasting during the month of Ramadan, as laid down in the holy Quran (2:183-185), is the fourth pillar of the faith. According to the Quran, this entire month is ordained for fasting and abstinence by all adult Muslims. Fasting begins at daybreak and ends at sunset, and during the day eating, drinking, and smoking are forbidden. A cloudy sky may delay or prolong the Ramadan fast. For, the the beginning and the end of the fast depends on the sighting of the crescent moon. It takes one trustworthy witness to testify before the authorities that the new moon has been sighted. And the Ramadan announcements are made accordingly. According to Quran, for a person who is sick or on a journey, fasting may be postponed until "another equal number of days." The elderly and the incurably sick are exempted through the daily feeding of one poor person. According to the Quran, the fast of Ramadan has been instituted so that believers may cultivate piety. 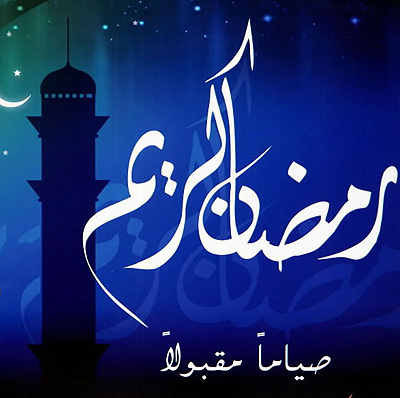 The fast during Ramadan begins each day at dawn and ends immediately at sunset. During the fast period, Muslims are forbidden to eat, drink, smoke and make love. Before retiring for the night, special congregational prayers are offered in which long passages from the Quran are recited. The day after the end of Ramadan is Id-ul-Fitr, the festival that celebrates the breaking of the fast with special prayers and festivities. In the Quran,the development of the Ramadan fast, which is one of the five Pillars, or basic institutions, of Islam, may be traced from the injunction to fast on 'Ashura' , the 10th of Muharram, probably once identical with the Jewish Day of Atonement. This injunction was abrogated by a command to fast during Ramadan (2:184). Unlike the period of fasting observed in other major faiths, fast in Ramadan is seen less as an atonement and more as an obedient response to a command from God. Iftar" literally means breakfast. It is a meal served at the end of the day during Ramadan, to break the fast. The month of Ramadan brings the families closer sharing the evening meal, paying visits to each other after sundown, giving alms to the poor and fondly remembering the ones who are no more. The Quran forbids the Muslims to eat or drink anything during the daylight hours. Following the sunset, the Muslims break their daylong fast with the meal called "Iftar". After they have taken their meal, it is customary for them to visit friends and families. The fast is again resumed the next morning. An "Iftar" meal is not to be confused with a regular meal that you can invite your friends and families to share. It is considered impolite if one reaches late for the meal. It’s discourteous to keep somebody waiting over the meal. Once the Ramadan Canon and the call for prayers announce the end of the fast, everyone has to take to the table and break the fast. The meal is usually a sumptuous one and is wrapped up with Qatayef, a Ramadan delicacy that can only be found during the Ramadan month. After the "Iftar" meal, people take on to the streets in jovial spirits and the festive mood spills over. The shops remain open well after the midnight. Some people stay up all night through until the "Suhour" meal that that is taken immediately before the resumption of the fast, early in the morning.